Chalk Talk: A Kindergarten Blog: Classroom Faces t-shirts Giveaway!! I am SO EXCITED about this giveaway!! I wish I could win it myself!! A+ Images, Inc. has VERY GRACIOUSLY agreed to give away 24 of their Classroom Faces t-shirts!!! If you have not see these super cute classroom t-shirts then you have to check them out at ClassroomFaces.com!! You will fall in love with them and want them for your class. Use them for class pictures, field trips, graduation, field day, or other class activities and projects. There are 24 different colors to choose from. You follow a few simple step-by-step instructions to create the shirt, mail in the order form and payment, and you are all set. Entering the giveaway is simple. All you have to do is 1) Check out ClassroomFaces.com 2) "Like" A+ Images, Inc. on Facebook and 2) leave a comment or comments below saying you did both. Don't forget to leave your email address when you comment. LOVE these shirts! I saw them at the IRA reading convention 2 years ago. I looked at the website and LIKED their facebook page. Thanks for having such an awesome giveaway! Those shirts are too cute! Checked out the website and Liked on facebook. I checked out classroom faces and I love the red shirts (school color). I liked at Images, inc Facebook page. What a great giveaway. Done and done. I have been wanting these! Those are just adorable! Got my fingers crossed! I checked out their page and "liked" them on facebook. How cute and clever. What an awesome keepsake for Kindergarten. I like how you can either do one or more classes. I liked them on Facebook. Thanks for such a great giveaway! I looked at the webpage and liked A= Images on facebook! What adorable shirts!! I love these shirts. I "liked" them on FB and also checked out their page. Now I have done my part, please do yours, and pick me. Thanks so much! I liked them on FB and checked their page out! These are so adorable. Cute shirts!! I visited their webpage and 'liked' them on facebook. How precious! I checked out their website and liked them on Facebook! I have done both task!! I have loved these every since I saw them last year! these shirts are tooo cute!! my preschoolers would love them. i checked out both pages. this is a great giveaway! Just happen to check out your blog and noticed this. I visited the website and liked on facebook. Did both - went to both pages and liked on Facebook! I love this company and recently ordered the "First Grade Rocks" shirt. It is GORGEOUS! I would LOVE to have the shirts for my class! Love the red shirts! I checked out both pages. Thanks for the chance to win. I visited the website and liked on Facebook. Saw these shirts at I Teach K this summer. They are awesome! "Liked" them on FB. What great shirts! I checked out the website and liked them on Facebook! These shirts are so cute!! I want them for my first graders! DId both -- website and fb! LOVE THE SHIRTS! I did both! I am in love with these shirts! So stinkin' cute!!! Love these! I checked out the site and like them on facebook! Thanks for offering such a grand giveaway! Love these shirts! I checked out the website and liked them on facebook. I have 22 students plus an assistant, so this would be perfect! Checked out the website and liked them on Facebook! I had never heard of these before, but boy are they adorable!! Checked out the website and liked on Facebook! The shirts are great!! I did both tasks. I love their teacher shirts too! I love those!!! So cute! I checked out their website and "liked" them on facebook. I think $11 for shirts are awesome! love. love. love! these shirts. my kindergarteners would love them! checked out the website and liked on A+ Images, Inc on FB. :) we will be getting these for sure! I went to their website and LOVE it!!! Yay! These are awesome shirts!!! I checked out their website and liked them on Facebook! Love these shirts. I liked them on facebook and checked out the website. My kindergartners would look terrific in them! Did both jobs-would love to win these for my kindergarten class! these are too cute...I did both!! Love the shirts! I visited the website and I like them on Facebook. I did both! These shirts are too cute!! Love love love those shirts! I checked the website and liked on Facebook. These are awesome! I checked out the site and liked them on facebook! I checked out the website! 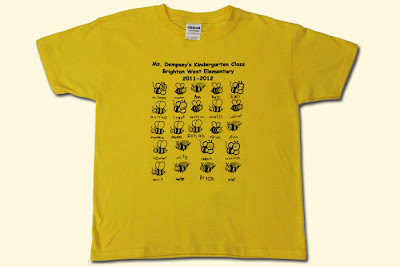 I just saw a teacher wearing one of these shirts a couple weeks ago and was dying to find out where she had them done! I definitely checked out their site and liked them on facebook - hope I'm lucky! What great shirts. This is the first time I have seen them. I looked at the sight and liked them on FB. This is such a cool way to build community with your class's wardrobe! I love those shirts!! I checked out the sight-- it's awesome they have different colors to choose from! Then, I liked them on Facebook. I'd love to win these shirts for my new little kindergarten class! I liked them on Facebook! Crossing my fingers I'm the lucky winner! I checked out the website and love these shirts! What a great giveaway! I checked out their site and liked Classroom Faces on facebook. Send those shirts my way! Did it, did it, done. Checked out the websit and liked on facebook. I've always wanted to do these with my kiddos. Crossing my fingers! Checked out their website. Cute stuff. Liked on facebook. I would be SO excited to win these! I did both. LOVE the shirts! These are so cool! I checked out their website and liked them on FB! love them did both. Would love to have them for my new kindergarten class. I went to classroomfaces.com. SO cute and fun! here's my email left comments liking and that i checked out website! Those shirts are so cute! I would love for my class to be able to win this contest! I checked out the website and "liked" A+ Images, Inc. on Facebook. I checked out the website and liked on Facebook! LOVE these! I checked out their site and liked A+ Images on Facebook! These are GREAT! I checked out the site and liked A+ Images on FB. Thanks!!!! I went to the website! Love it! I liked the FB page too! Loved the t-shirts. How special it would make my students feel. I love these shirts!! I saw them at CAMT this summer and just think they're so cute!! I looked at website and liked on facebook. I did both! These shirts are the cutest!!! I remember my classroom shirt from preschool! I LOVE these shirts they are adorable. I am teaching kindergarten for the first time this year and I know my little ones would be cute in these. I "liked" their Facebook page and checked out the website. Thanks for sharing!!! Very cute shirts! I think my class would love them! Oh, I checked out their website and liked them on facebook. So fun! I LOVE these shirts! I looked at the website and LIKED their facebook page. What an awesome giveaway! SO super cute. I checked out classroomfaces and liked A+ Images. These shirts are so cute! I visited their website and liked their facebook page. Crossing my fingers for a win! What a great way to start the school year! I visited their website and liked them on Facebook. I liked A+ Images on FB. I've checked out the website and "liked" A+ on Facebook. My kiddos would LOVE these!! I checked our the page and liked them on FB. The shirts are adorable!! I checked out ClassroomFaces.com and bookmarked them. I like A+ Images on Facebook. These kids t-shirts are so fabulous.these tees makes a full sense of perfect clothing.